There’s something about a saint’s story that speaks to us across the generations. How we see our stories reflected in theirs. And we know that if such holiness can shine through in such a story, perhaps we can access it in our own times, in our own stories. Such is the case with St. Kateri Tekakwitha, whose feast we celebrate on July 14. The first Native American saint from the territories of the future United States and Canada, she is popularly venerated as a patroness of ecology. When Kateri was a young girl, a smallpox epidemic took her parents, along with her baby brother, leaving her with pocked skin and diminished eyesight. We can sense how much of her vision she lost from the name “Tekakwitha,” literally, “One who walks groping for her way.” What spiritual seeker cannot see themselves in that name? Yet, as a testament to her faith in God, upon her death at 24, witnesses described her smallpox scars disappearing, and her face shining with a holy radiance. And in her saintly legacy, she has made a way for countless seekers to follow. Despite the lack of a formal education, and Christian scriptural materials being rare and suspected, Kateri became a living Bible and living catechism. “Kateri, tell us a story,” her Mohawk companions would ask her, and she would share stories from scripture, and joyfully tell them of God’s plan for humankind, of his love and mercy, of the great dignity of each human person. The Church finds God’s grace in the cultures of all believers. And in Kateri, we have found the grace of her Native American peoples, who have long modeled the call to be stewards of Creation, seeking to live in harmony with nature. The Iroquois (Haudenosaunee) tribes had (and retain) a deep connection with the land, managing resources carefully, and following closely the rhythms and patterns of nature. CRS embraces the legacy of St. Kateri Tekakwitha. We pray that her spirit may animate our work, and that our work honors her holy legacy. We offer these resources, to bring the model of St. Kateri and her care for creation into your families and faith communities. 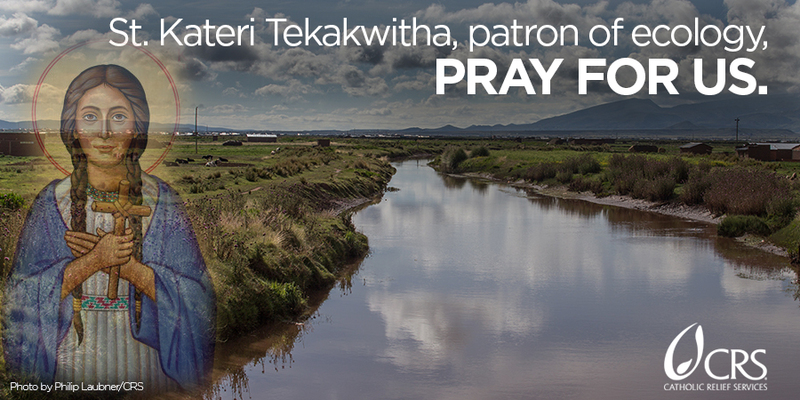 St. Kateri Tekakwitha, Lily of the Mohawks, pray for us!